We're just taking a short break from the actual top ten list to focus on the films not featured on the blog already. Coming up with a Hitchcock top ten wasn't easy. I'm still kicking myself over the films that I didn't pick. It's like picking a favorite child really. Much like our last entry, this film also stars Cary Grant. This is arguably one of his best performances. SUSPICION is a romantic psychological thriller about a shy young English woman who begins to suspect her husband of trying to kill her. It's really a simple plot that doesn't need to be explained any further. It'll have you guessing all the way to the very end. Is Cary Grant's character a murderer? Or is it all just one big misunderstanding? 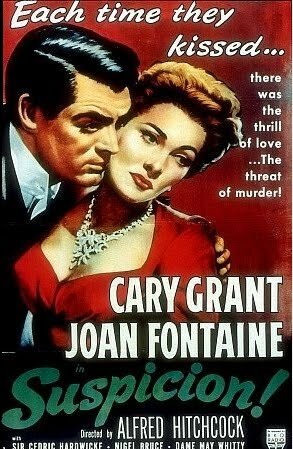 With great acting from both Grant and Joan Fontaine, SUSPICION will have you on the edge of your seat. There's one scene in the film that really stands from the rest. 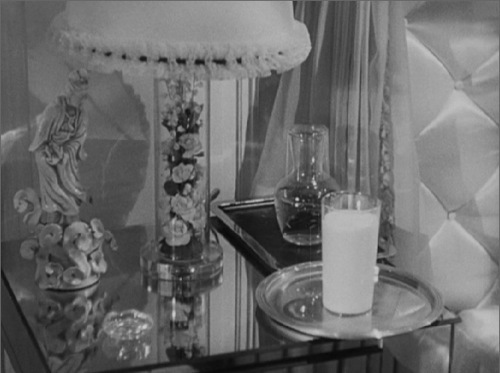 It's the scene where Johnnie (Grant) brings his wife a glass of milk to her while she's in bed. To make the imagery stand out, they actually placed a light bulb inside the glass to make it more stunning. You begin to wonder if he did something to the milk. Poison perhaps? You'll just have to watch the film for yourself if you haven't done so already. CAMEO NOTE: Hitchcock actually has two cameos in this movie. Four minutes in you can see him walking a horse across the screen at the hunt meet. The second is about six minutes into the movie where he's tossing a white sheet of paper while the bus pulls up for Robert Donat and Lucie Mannheim to leave the theater.